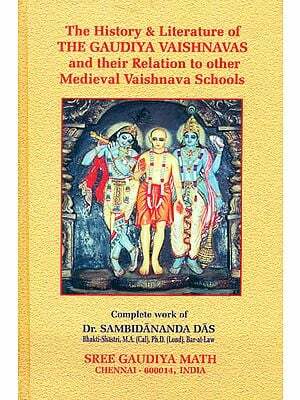 This important study presents a comprehensive and critical survey of Vaisnava-Bhakti movements through the ages; its vedic origin, medieval evolution and modern trends in India. The learned author acquaints readers with numerous hidden, symbolic meanings behind anthropomorphic form of Vishnu, his incarnations, Radha, devotee, methods of worship and the siddhis a devotee secures through Bhakti-yoga. It brings into light the philosophies of Ramanuja (Visistadavaitavada), Vallabha (Suddhadvaitavada), Nimbarka (Dvaitadvaitavada), Namadeva, Tukaram, Kabir, Chaitanyadeva, Tulsidasa, Mirabai, Sankaradeva, Mahadeva and his successors. This monotheistic research on Vishnu is based on ancient Sanskrit scriptures and throws a search light on obscure, hidden, symbolic, philosophical, psychological and historical meanings behind Vedic and Puranic stories and legends. Late Shri Rabindra Kumar Siddhantashastree (1911-1983) had all along an extraordinary brilliant academic career. Besides being a Premchand Roychand scholar (Calcutta, 1955) he is a holder of five Tirtha and seven Shastree titles and was lecturer in the department of Ancient Indian History and Culture, Calcutta University before his sad demise. He is an author of a number of valuable and thought-provoking books which will keep his name alive in the word of scholars of Indian religions. His contributions to human knowledge are Saivism Through the Ages (1975) History of Pre-Kaliyuga India (1978). Bhattacharyya, Narendra Nath  History of Sakta Religion     Carpenter, J. Estlin  Theism in Medieval India    Gonda, J.  Visnuism and Sivaism: A Comparison    Jaiswal, Suvira  The Origin and Development of Vaisnavism    Raychaudhuri, Hemchandra  Materials for the Study of  the Early History of the Vaishnava Sect. Siddhantashastree, Rabindra Kumar  Saivism Through the Ages    Walker, Benjamin  Hindu World, complete in 2 vols. by Prof. (Dr.) Susmita Pande, D. Litt.